When I ran for State Senate in 2006 the best part of the campaign was getting out in the District, meeting people, and engaging in serious civil conversation. The voters I met did not always agree with me (although many of them did!) but we discussed issues important to them, to me, and to the residents in District 9A (Howard County) and 9B (Carroll County). The worst part of that campaign was raising money. This is still true today. I personally find it very uncomfortable asking voters to contribute to my campaign, especially in these tough economic times, but I know I must do this to remain a serious viable candidate. I am well aware that I must raise sufficient sums of money to mount a competitive campaign, both for the primary and the general election. Someday a public financing bill will pass the state legislature, and maybe also a law will be passed legislating term limits on delegates and senators(similar to the governor), but until then I will vigorously solicit funds to run my campaign. No amount is too small! 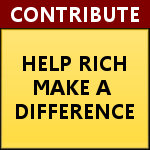 A lot of my 2006 contributions were in the $5, $10, $25 range and any contribution you give me will be greatly appreciated and will go toward getting the leadership in Annapolis we desperately need for District 9A !